Invisalign is a corrective clear aligner to help straighten the misalignment, and slight imperfections of one’s teeth. It is the most used aligner in the world, ranging over 5 million users. Out of these 5 million, 1 million of their clientele are teenagers. Invisalign is an easier, more accessible and environmentally healthier alternative to braces. These aligners consist of a thin, clear plastic, allowing for the ultimate comfort. While this truly may be a reimagined teeth corrector, it is unknown whether or not this undisclosed plastic material is safe enough for Invisalign’s 5 million consumers and potential buyers. While reading around through Invisalign’s official website, they mention that the Invisalign is made from a SmartTrack material (Invisalign). Unfortunately, that is the only information given on the website. After further investigation, it is found that the SmartTrack material is a medical grade plastic. This medical grade plastic has been rightfully FDA approved. In this research paper, it will be discovered what SmartTrack Material is and the Invisalign’s life-cycle. So you decide you want to get Invisalign aligners. The first step is easy to receiving your Invisalign aligner. You must pay a visit to your local dentist’s office. As soon as sitting on the patient’s chair, the first step is to get your teeth scanned. Before the iTerro scanner, this would be done by x-rays, biting down un uncomfortable plastic, and applying a substance to create a mould of your teeth. Fortunately enough, this painfully awkward procedure has been simplified. As of recently, Align Tech. found a quicker and a less environmentally detrimental way of scanning their consumer’s teeth. As of 2016 , they do this by using the iTerro scanner (Align). This scanner creates a 3D model on their computer allowing the dentist to create a personal aligner that is meant for each person. From that point forward, the dentist is able to make a digital impressions of the ideal aligner for their patient on a software like CAD/CAM systems. Right after, the dentist could then put in the order to their manufacturing facilities in Juarez, Mexico. The final step is to wait for the aligners to arrive at the dentist’s office. The distribution of the Invisalign aligners comes from where the aligners are created (Align Technology Inc). Unfortunately, there is really one prime material that goes into creating the Invisalign aligner. On the bright side, research has been done and with some in depth digging the prime material is made up of important materials to make the prominent material. Under manufacturing and suppliers, it is mentioned that Invisalign purchases all of their resin and polymer from a single supplier. Polymer is another word for plastic. “Polymer are composed of hydrocarbons, compounds of carbon and hydrogen” (American Chemistry Council). There are different types of resin. There are natural and synthetic resins. Synthetic resins are not too different than plastics (Britannica). Polymer and resin are the primary raw material that goes into making SmartTrack Material. The medical grade plastic’s prime material used for this is thermoplastic polyurethane, also known as TPU (Align Technology). Polyurethane is an instant chemically made invention. The production of TPU is created by “reacting linear polyols, organic diisocyanates, and a hydroxyl group containing chain” (U.S Patent). Possible primary raw materials extracted from the Earth to create TPU are iron (Fe), magnesium (Mg), manganese (Mn), and sodium (Na). This is only to be assumed because these were determined to be in polymeric diphenylmethane dianiline (MDA), which is a secondary raw material that helps produce polyurethane. The reason for that is because MDI and MDA are scientifically removed from TPU for health reasons, that this research will go over briefly accordingly. It is important to be able to carefully create TPU. If the polyols, diisocyanates, and hydroxyl groups are mixed too slowly, it will result in an insoluble infusible gel (U.S Patent). If overheating occurs, it will result in a secondary raw material Diphenylmethane Diisocyanate (MDI). Even though MDI and MDA are both important materials to create TPU, they are scientifically morphed and changed to strip the toxicity that may remain during the process for the prioritization of Invisalign’s consumer’s health. If a slight mistake were to occur, the exposure to MDI can result in asthma-like symptoms. Some examples of these symptoms include and may be coughing, wheezing, shortness of breath, and/or even an asthma attack. Fortunately enough this is a problem Invisalign can rightfully avoid. The reason for this is because they know exactly the melting point that is required, and it’s flash point. If heated at more than 212° F, and less than 410° F it will result in MDI (Align Technology, Inc). There aren’t any records, and it isn’t identifiably known for the Invisalign consumers to file a complaint of severe side-effects. Therefore, it is to be assumed that Invisalign and their manufacturing facilities in Juarez, Mexico know exactly what they’re doing to avoid the problem of letting MDI and MDA linger in their products. At the point of arrival they arrive in boxes, and the Invisalign aligners are packaged in plastic bags. The boxes they came in is unknown, but is to be assumed that they are made from a thick paper/cardboard material. What comes inside Invisalign aligners neatly packed inside in tiny little plastic bags. It is assumed that these plastic bags that hold the aligners are made out of polypropylene. Polypropylene (PP) is the most common used plastic for packaging, which is why the best guess is that PP is the plastic being used for the packaging. It is only to be assumed that PP is what is used for the distribution of Invisalign Aligners. Researching for the most common plastic used for bags lead me to believe that it might be high-density polyethylene (HDP). While diving deeper into the research, it was soon discovered that this plastic is most commonly found for plastic bags in retail store. The research was only getting started. PP is the most common found plastic that is used for packaging. It is also used to hold food items and condiments, such as syrup, yogurt, ketchup, etc (American Chemistry Council). All in all, polymer and resin are the primary raw materials required for the creation of the SmartTrack material. The SmartTrack material is in fact thermoplastic polyurethanes (TPU). Since TPU involves of many compounds, is not to be confused with polyurethane (PUR) since they differ slightly. Thermoplastic polymers aren’t ready to made like PUR. Their melting point must be mixed at their designated >212° F state, and heated > 410° F to avoid flash point. From the very start, TPU involves of MDI and MDA but are stripped away from both to avoid uncomfortable symptoms. 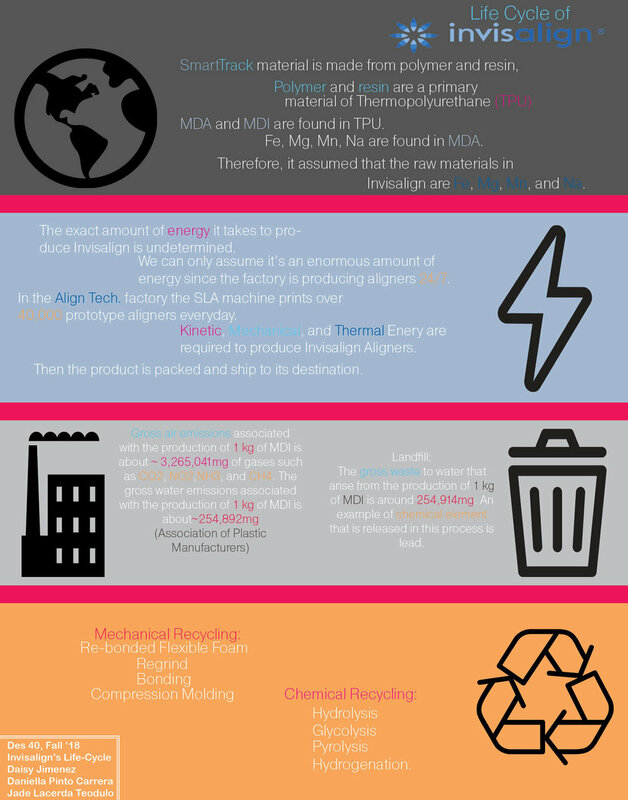 Although many raw materials have been extracted from the Earth to create TPU, the ones most commonly found in MDA once again are, Fe, Mg, Mn, and Na. Polymer in general is indeed able to be recycled, and sustainable. There are two possible ways that polymer can be reused. The first one being that it can be reutilized and recreated into its polymer form. This allows it to be stripped down and possibly used again for future Invisalign aligner consumers. The second option is that it is will be chemically grounded, and then chemically rebounded to be turned into a polyurethane foam (SPF). There are many possible ways for polyurethane foam to be used. The biggest most drastic one being SPF being used in homes. This allows Americans to save up to $33 billion in energy costs each year (American Chemistry Council). Not only does it allow polymer to be reused, it also allows Americans to help save their energy costs, and stop from the landfill to grow. Unfortunately Invisalign aligner’s life-cycle is neither determined or concrete. There aren’t any information on what Align Technology Inc. does with their Invisalign aligner products. It is to only be assumed that since the consumer’s decide whether they decide to take it back to their dentist’s office, or throw it away themselves. This results in the assumption that the Invisalign aligners are being thrown and collected into the landfill. This is unfortunate because the possible outcomes that can occur if recycled correctly, can result in less waste, energy, and can even financially result in saved money. By the end of this research, the primary material was identified to be TPU. It went as far back as to investigate and assume that the raw materials extracted from the Earth are Fe, Mg, Mn, and Na. It is up to the interested consumer to decide whether or not the amount of energy that is put into making the Invisalign aligner, and the waste that results in it is worth actually worth it. Unfortunately the final stage of its life-cycle is only to be assumed. There are two possible options. The environmentally better option being that it is being recycled and reutilized into another kind of plastic. The second detrimental option is that this product that 5 million people are consuming are getting thrown into the landfill after they’ve been done with its use, which ranges every two weeks of use. Align Technology, Align Tech, Inc., www.aligntech.com/. Accessed 1 Dec. 2018. Britannica, Inc., 11 Apr. 2016, www.britannica.com/science/resin. Accessed 1 Dec. 2018. Boustead, I. “Eco-Profiles of the European Plastics Industry.” PlasticsEurope, Mar. 2005. Edgar Online, Inc., 28 Feb. 2017. “Material Safety Data Sheet.” Align Technology, Inc., 8 Dec. 2015. Production Using Direct Sampling Graphite Furnace Atomic Absorption Spectrometry.” Journal of Materials Chemistry C, The Royal Society of Chemistry, 28 Nov. 2013, pubs.rsc.org/en/content/articlepdf/2014/ja/c3ja50328c. In 1997, Align Technology created Invisalign in San Jose, California. The inventor of Invisalign, Zia Chishti created an innovative orthodontic product, that didn’t require metal braces to align teeth. Instead, it uses transparent removable aligners that are replaced thr ough the treatment to position patients’ teeth to an aesthetically correct position. The steps taken to make an aligner possible requires a significant amount of energy through many stages during its production. The embodied energy of the production of Invisalign requires different types of energy from materials and manufacturing during its life cycle. The life cycle of Invisalign aligners begins with the material of the product. Invisalign is composed of SmartTrack, a material that was specifically design for the Invisalign clear aligners. This material is “highly elastic, gentle and has more constant force” than previous materials . One of the main materials in the SmartTrack is polyurethane, that is composed of oil and natural gasses that uses, kinetic, chemical, mechanical and thermal energy to extract the materials from the earth . An organic compound in the polyurethane is diisocyanate (MDI) with a chemistry formula of CH₃C₆H₃(NCO)₂ . The total energy required to produce MDI was recorded in the European Association of Plastic Manufacturers in 2005 by I. Boustea. In 2005 the total electricity required to produced 1 kg of MDI annually was 15.39MJ . This total includes the fuel prod and delivery energy with a gross total of 10.43MJ; the energy content of delivered fuel had a gross total of 4.59MJ; and the energy use in transportation had a gross total of 0.37MJ . The total energy of oil fuels was 27.59MJ and the total of other fuel energy was 47.98MJ . The most important part of the aligner is the material, without it manufacturing wouldn’t be possible. The Invisalign process begins in an orthodontics’ office with a teeth impression or an iTero scan of the teeth and the gums. In 2015, Align Technology created the iTero scan to make dental impressions faster by scanning the teeth rather than using the impression material. The iTero scanners uses an “open architectural platform” that lets the dentist and lab technicians transfer stereolithography (STL) files of the patients digital teeth impression  . Since this type of device was made in the last three years, the information about the energy consumption for this product was difficult to acquired. We can assume the energy used during the scan is thermal, kinetic, and mechanical. This includes the kinetic energy used by the dentist or clinical technician when scanning the teeth with a wand, that releases a small amount of thermal energy on the teeth and gums when scanned on the iTero machine that requires electrical energy to function. The second type of process used to take an impression is by using an impression material such as alginate or polyvinyl siloxane in an orthodontics office . The energy during this procedure comes from the force of the mandible, with the form of potential energy that gradually becomes kinetic energy as the teeth put pressure to form an impression on the material . A study with a similar type of dentition force was conducted in the prosthodontic clinic of King Abdulaziz University, in Saudi Arabia. The aimed of this study was to “measure the occlusal force, and the force transmitted underneath two different distal extension removable partial dentures” . The result of the study concluded that the occlusal force of the two different dentures was 26.95 ± 9.36N and 49.02 ± 22.29N . With the conclusion of this data we can assume that the energy created during the impression of the teeth are around 26.95 ± 9.36J and 49.02 ± 22.29J. After the impression is taken, it is scanned and digitized and send electronically to an align facility in Costa Rica, where the fabrication of the aligners take place . When the patients’ molds are electronically send to the factory, a new three- dimensional model is created. Then, “the three-dimensional model is uploaded to a computer aided design system (CAD) and each tooth is separated by a computer process” . After each individual tooth are separated, they are position in different stages of the patients treatment to make different aligners that will help the teeth achieve an aesthetically correct smile. This computer configurations prints a mold that will be used to make the aligners. A computer in the Align Technology factory produces in an eight hour period an average of 200 W/hour, and almost 600 kWh and emits 175 kg of CO2 per year . But if the computers in the lab are being used twenty-four hours a day every day during a year it will use 1,752,000 watt-hours, or 1752 kilowatt-hours . With 1.5 METs being used for each individual person working in a computer . With the help of the CAM/CAD the signal for the printing and fabrication can begin. The Align Technology factory uses mechanical, electrical and possibly solar energy to power their machines to produce the Invisalign aligners. The fabrication of the aligner begins with the automated assembly line, where the teeth molds are labeled using mechanical and thermal energy. The mechanical energy would be present when the machine is doing movements to label the molds that we can assume it is accomplish with the transfer of thermal energy. Then, they are moved to a RFID (Radio Frequency Identification) tray that move’s the aligners through various stages of manufacturing. The RFID machine produces mechanical energy that has a “maximum energy consumption when transmitting and receiving data” . Even though the amount of energy was not found for a factory RFID machine, during this research, it can be assumed that this machine requires enormous amount of mechanical, electrical and thermal energy for it to work twenty-four hours a day, seven days a week. One of the most important machines used in the manufacturing of Invisalign aligners is stereolithography (SLA) machine, that produces over 40,000 prototypes parts a day . The stereolithography uses ultraviolet laser on the material . The SLA machine works together with the computer aided manufacturing (CAM) and computer aided design (CAD) to prototype an aligner. The ultraviolet laser draws and begins printing single layers of the Invisalign aligner with the SmartTrack material. The thermoformed clear polyurethane has a thickens of 0.020-0.035 inches that has the “sufficient tensile strength and elasticity to retain the original shape of the aligner” . In a study done with different printing machines, the information for the energy consumption of the an SLA, “ layer thickness 0.025 mm, curing time for stable layers 6 seconds, curing time transition rate 1.125 seconds/layer, and orientation 0°, the measured energy consumption is 278,707.35J for building a bolt with 1 centimeter of height” . We can assume that the energy required to make Invisalign will be higher than this study, since the manufacturing machine is much larger than the one used for this study. Then the printed aligner get cleaned with a solvent to take left resin out from the exterior of the aligner . After this process the aligners is sent to trimming that is done by a machine to make cuts and trims with specific data from the CAM and CAD system. When this step is completed the aligner is send to polishing that is also done with a different machine. Although some of the machines and data were not found for the polishing and trimming, we can assume that it requires, mechanical, thermal, chemical and some kinetic energy to accomplish this task. After this step the aligner is ready to get packaged and send to their destination. The last step in the Invisalign factory is packaging before it gets delivered to the patients. The packaging process uses both mechanical and kinetic energy to accomplish this task. is fully automated. The machine that is in charge of this process was not found during this research and we can assume that this manufacturing machine uses a lot of energy. The RFID machine selects each aligner from the carousel and selects the ones that go with an specific patient and orders them in the correct way that need to be used during a patients treatment. Then the aligners are sealed individually, then put in a bag that gets sealed and lastly in a box that gets tamper- proof seal. Then the completed product is ship to a patient. In summary Invisalign, is made from SmartTrack material that is printed using a SLA three-dimensional printed machine that uses CAD/CAM systems to design and give specific data for the production of each aligner. Although, the energy it takes to make an aligner is inconclusive, the different types of energy used from the beginning of the life cycle to the end of the life cycle were discussed. 1.Alammari, Manal R, et al. “Http://Www.jofamericanscience.org/Journals/Am-Sci/am0810/054_11207am0810_367_372.Pdf.” Journal of American Science, 20 Sept. 2012, www.jofamericanscience.org/journals/am-sci/am0810/054_11207am0810_367_372.pdf. 2. “Align Technology Announces January 21st Availability of SmartTrack(TM) Invisalign(R) Aligner Material.” Align Technology Announces January 21st Availability of SmartTrack(TM) Invisalign(R) Aligner Material (NASDAQ:ALGN), 18 Jan. 2013, algn360.client.shareholder.com/releasedetail.cfm?releaseid=734376. 3. “Align Technology Offers a Range of Digital Treatment Solutions for Dental Professionals, Including the Invisalign System for Comprehensive Orthodontic Treatment. Invisalign Clear Aligners Have Been Used to Treat Minor to Complex Malocclusion for More than 5 Million Patients Worldwide.” Align Technology, www.aligntech.com/solutions/itero. 4. Boustead, I. Eco-Profiles of the European Plastic Industry . 2005, www.polyurethanes.org/uploads/documents/eco_midi.pdf. 5. Casablanca, Clinique Dentaire, director. Invisalign Manufacturing Process English. YouTube, YouTube, 7 Apr. 2014, www.youtube.com/watch?v=vsR0_wTR2a8. 6. Harlan, A W. “The Dental Review: Devoted to Advancement of Dental Science .” The Dental Review: Devoted to Advancement of Dental Science , vol. 14, pp. 181–181. 7. “How Much Power Does a Computer Use? And How Much CO2 Does That Represent?” Energuide, www.energuide.be/en/questions-answers/how-much-power-does-a-computer-use-and-how-much-co2-does-that-represent/54/. 8. Lim, Ali Kashif BashirSe-Jung, and Chauhdary Sajjad HussainMyong-Soon Park. “Energy Efficient In-Network RFID Data Filtering Scheme in Wireless Sensor Networks.” MDPI, Multidisciplinary Digital Publishing Institute, 6 July 2011, www.mdpi.com/1424-8220/11/7/7004/htm. 9. Mansoubi, M, et al. “Energy Expenditure during Common Sitting and Standing Tasks: Examining the 1.5 MET Definition of Sedentary Behaviour.” Current Neurology and Neuroscience Reports., U.S. National Library of Medicine, 29 May 2015, www.ncbi.nlm.nih.gov/pubmed/26021449. 10. Morton, John. “I Made That: Align Technology's SmartTrack: an Interview with John Morton, Director of Research and Technology Product Innovation.” Gale Business Insights:Global, Feb. 2013, bi.galegroup.com.ezp.pasadena.edu/global/article/GALE%7CA322499919/fe1cf4d744169a8672f84f3f7dc2bac3?u=pasa19871. 11. Moshiri, Shuka, et al. “Cephalometric Evaluation of Adult Anterior Open Bite Non-Extraction Treatment with Invisalign.” Dental Press Journal of Orthodontics , SBQ, www.scielo.br/scielo.php?pid=S2176-94512017000500030&script=sci_arttext#B34. 12. “Saving Electricity.” How Much Energy Is Used for Cooking? Gas vs. Electric?, michaelbluejay.com/electricity/computers.html. 13. Tuncay, Orhan C. The Invisalign System. Quintessence, 2006. 14. Watson, Shawn. “How a Dental Impression Is Made.” Verywell Health, Verywellhealth, 2018, www.verywellhealth.com/understanding-dental-impressions-1059424. 15. Yang, Yiran, et al. “Energy Consumption Modeling of Stereolithography‐Based Additive Manufacturing Toward Environmental Sustainability.” The Canadian Journal of Chemical Engineering, Wiley-Blackwell, 4 May 2017, onlinelibrary.wiley.com/doi/full/10.1111/jiec.12589. The rampant and mindless consumption of material goods propelled by the Industrial Revolution starting in the late 1700s, contributed to the deterioration of the environment in many ways. Especially due to the unbridled usage of natural resources, factories emissions, and product waste. The impact of industrialization on the environment has forced us to become more mindful of the products we are utilizing, the processes in the creation of these devices, and the ways in which they will affect our planet in the long run. In other words, this impact led us to further investigate and become more aware of the life cycle of products we consume. And one of the products that have recently incited my curiosity in terms of sustainability is Invisalign, a relatively recent substitute to braces. The Invisalign System is a method for treating malocclusion based on a series of doctor-prescribed, custom manufactured, clear plastic, removable orthodontic aligners (Align Technology Inc). Although the company was founded in 1997, this alternative for fixing the misalignment of teeth only became popular around 2010 (Hi5Orthodontics). The arising popularity of this upcoming product has led to question the sustainability factors behind its design. In prospects of informing consumers and possible users, this research will examine the emissions, recycling processes and waste of Invisalign. In order to find out about these elements, we first need to identify what are the materials implemented in the production of Invisalign. According to the company’s website, Invisalign is made of a patent material called SmartTrack. After further investigating Invisalign’s Material Safety Data Sheet, it was identified that SmartTrack is made of Thermoplastic Polyurethane (TPU). TPU is a class of polyurethane, which is a polymer, meaning that it is a type of plastic made out of hydrocarbons, compounds of carbon and hydrogen (American Chemistry Council). In its rawest form, this polymer is composed of Iron (Fe), Magnesium (Mg), Sodium (Na), and Manganese (Mn). These elements can be found in Methylene diphenyl diisocyanate (MDI), also known as Polyurethane’s secondary raw material. Now being aware about the materials that are put into creating SmartTrack, it is able to continue the research to find out the emissions of this product. After arduous research for the emissions linked with the production of Invisalign, the only able find is MDI’s Eco-Profile. According to the Association of Plastic Manufacturers, the gross air emissions associated with the production of 1 kg (1000000mg) of MDI is about ~ 3,265,041mg of gases such as Carbon dioxide (CO2), Nitrogen Dioxide (NO2), Ammonia (NH3), and Methane (CH4). From this approximate total, about ~ 1,900,790mg derives from fuel use, ~408,581mg originates from transport, around ~873,540mg is from fuel production. The remainder is linked to Industrial Process, Biomass, and Fugitive emissions. Further investigating the impacts of MDI on the environment, it is discovered that Carbon dioxide equivalents corresponding to the gross air emissions for the production. Carbon dioxide equivalent (CO2e) is a term for describing different greenhouse gases in a common unit. For any quantity and type of greenhouse gas, CO2e signifies the amount of CO2 which would have the equivalent global warming impact (Brande). In its 20-year global warming potential (GWP), CO2 emitted in the production of 1kg of MDI is equivalent of 5,300,000mg. When it comes to its 100-year GWP, the input of the gasses are 3,900,000mg. Analyzing as far as 500-year GWP, the amount of Carbon dioxide that will still be around due to the production of only one kilogram of MDI is of 3,400,000mg. In addition to the gross air emissions, the water gross emissions are found. In the production of 1kg of MDI, around 152 mg is from fuel production, and about ~49mg derives from transportation. Process is responsible for polluting approximately 254,777mg, and fuel use is only accountable for less than 1mg. In summary, the gross emissions to water arising from the production of 1 kg of MDI totals ~254,892mg (Association of Plastic Manufacturers). Despite not finding data on the emissions of polyurethane itself, the discoveries of MDI’s discharge in nature can help us draw informed assumptions about a fraction of Invisalign’s life-cycle. Advancing on the research, it is advised to get informed about the options for recycling polyurethane. The two main ways in which polyurethane can be recycled are through Mechanical and Chemical Recycling. The first type of recycling consists in the reutilization of the material in its polymer form. The second form of recycling takes the material back to its various chemical constituents. When it comes to Mechanical Recycling, there are four ways of achieving it: Re-bonded Flexible Foam, Regrind, Bonding, and Compression Molding. Re-bonded flexible foam include pieces of chopped polyurethane foam to create products such as carpet underlay, and sports mats. This form of recycling represents nearly 90 percent of the carpet underlay market in the United States (American Chemistry Council). The second option for recycling is Regrind. This action employs used PU, and grinds it in various ways to create a thin powder. The resulting product is combined with virgin materials to create new polyurethane. Bonding is the most common physical recycling method (Yang et. al). In this process, polyurethane wastes are fractured into fine particles, mixed with Methylene diphenyl diisocyanate, and exposed to a high temperature of water vapor. When solidified, the result is a rigid polyurethane foam plastic. This can be applied to car lining and furniture (Reghunadhan & Thomas). The last option for Mechanical Recycling is Compression Molding, which is the action of molding the polyurethane in a confined shape by applying heat and pressure. This method creates products with up to 100 percent recycled content and material properties that can be superior to virgin materials (American Chemistry Council). Chemical recycling can be done is in four main ways: Glycolysis, Hydrolysis, Pyrolysis, and Hydrogenation. The Glycolysis process consists of causing chemical reaction by inflicting high heat on a mix of industrial and post-consumer polyurethanes with diols; this chemical reaction that creates new polyols, a raw material used to make polyurethanes (American Chemistry Council). In the Hydrolysis procedure, water and polyurethane are combined to create polyols and other intermediate chemicals. The polyols can be used as fuel and the intermediates as raw materials for polyurethane (American Chemistry Council). Although this alternative sounds relatively simple, it is very costly because of the high temperatures in which the water and PU need to be exposed. Moreover, the polyol produced is not easily purified, thus making the degradation cost considerably higher, and limiting the utilization of this method in real application (Yang et. al). Another method implemented in the Chemical Recycling is Pyrolysis. This process consists of thermal decomposition of polyurethanes under an oxygen free environment to create gas and oils. The last option for chemical recycling is Hydrogenation. Alike Pyrolysis, hydrogenation creates gas and oil from used polyurethanes through a combination of heat and pressure and hydrogen (American Chemistry Council). Even though many options are available for both mechanical and chemical recycling of Invisalign, Align Technology Inc. has not released any information on their recycling processes and proper product disposal procedures. Leading to assume that the company has no thoughtful commitment to recycle their used products. When recycling is opted out, waste polyurethane material can still be used for energy recovery in two methods: Combustion or Incineration. The combustion of PU is considered a great option, since it is directly related to energy recovery. According to the Polyurethanes Recycle and Recovery Council (PURRC), the comparable energy value of PU waste to fossil fuel resulted in a reduction of plastics waste amount in landfill. As reported by the European Diisocyanate and Polyol Producers Association (ISOPA), the addition of flexible polyurethane foam waste (up to 20% by weight) to municipal solid waste (MSW) resulted in result in improvements of energy production and generating emissions below operating limits. Some Europeans countries, such as Denmark, and Germany, can already produce electricity and heat energy form polyurethane waste by using MSW combustors connected with flue gas cleaning (Datta and Włoch, p. 350). The incineration process consists of burning polyurethane waste materials. This method is considered to be an incomplete combustion, and it can reduce PU waste volume to approximately 99% (Alavi Nikje, p. 405). Although incineration is a fast way to reduce the levels of polyurethane waste, it is not the best option for the environment due to the emission of poisonous gases to the atmosphere as its by-product. While landfill disposal can also be opted as a method of polyurethane waste management, the high volume of polyurethane foam waste is a big issue; because the decomposition of polyurethane waste in the natural conditions are very long and difficult. As reported by the Association of Plastic Manufacturers, the gross waste to water that arise from the production of 1 kg of MDI is around 254,914mg. An example of chemical element that is released in this process is Lead (Pb). This heavy metal is known to cause significant contamination of the Earth's soils and waters. As a consequence of the growing water and land problems, and increasing exhaustion of landfill sites, researchers have actively worked to develop several alternatives to landfill disposal of polyurethane, such as all the recycling processes mentioned above. Although this quantity of waste can sound relatively small, it is important to keep in mind that we were only able to find data for MDI only. And not the whole Invisalign product. Owning that, we can only assume that a lot more waste is being put into the environment. Following the thorough research about the emissions, recycling processes and waste of Invisalign, it is still unknown how committed the company is to invest their resources to help diminish the intense deterioration of the environment. And to establish strict recycle guidelines to their used products. Although the adoption of clear aligners can be a more eco-friendly alternative to braces, Align Technology Inc. lack of information on their Sustainable Practices Policy, leads us to assume that the production of Invisalign will only keep crudely affecting our planet. Brande, Matthew. "Greenhouse Gases, CO2, CO2e, and Carbon: What Do All These Terms Mean?" Ecometrica, Aug. 2012. Datta, Janusz, and Marcin Włoch. Polyurethane Polymers. 2017, pp. 323-58. Nikje, Mir Mohammad Alavi, et al. "Polyurethane Waste Reduction and Recycling: From Bench to Pilot Scales." Designed Monomers and Polymers, 2 Apr. 2012. “Polyurethanes.” How Polyurethane Is Made, polyurethane.americanchemistry.com/History/. Characterization, and Applications." Science Direct, 2017. “Understanding Global Warming Potentials.” EPA, Environmental Protection Agency, 14 Feb.